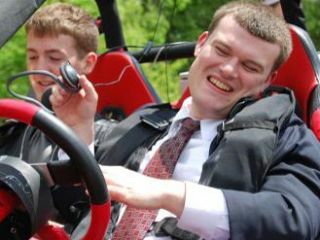 A revolutionary car designed by Virginia Tech allows blind people to get behind the steering wheel for the first time. The retrofitted four-wheel dirt buggy uses laser range finders, a voice command interface and a host of other innovative, cutting-edge technologies. For the first time, blind drivers can steer, brake and accelerate without any help from human passengers. Back in 2004, the US National Federation of the Blind challenged university research teams to develop a vehicle that would one day allow the blind to drive. Virginia Tech was the only institution to accept. "I thought it would be a very rewarding project," said Dennis Hong, director of Virginia Tech's Robotics and Mechanisms Laboratory. "We are not only excited about the vehicle itself but also about the potential of the many spin-off technologies from this project that can be used for helping the blind in so many ways." Sitting inside the vehicle, a blind driver can turn the steering wheel, stop and accelerate by following data from an on-board computer that uses sensory information from the laser range finder to serve as the 'eyes' of the driver. The team also developed non-visual interface technologies, including a vibrating vest for feedback on speed, a click counter steering wheel with audio cues, spoken commands for directional feedback, and a unique tactile map interface that uses compressed air to provide information about the road and obstacles surrounding the vehicle. "It was great!" said Wes Majerus, the first blind person to drive the buggy on a closed course at the Virginia Tech campus. "The car's instructions are very precise. You use the technology to act on the environment - the driving course - in a very orderly manner." The Virginia Tech research team is already planning major changes to the technology, including replacing the dirt buggy with a fully electric car, in order to reduce vibrations that can interfere with the laser sensor. However, even once the technology is perfected, laws now barring the blind from driving and public perception must be changed. "This is the piece that will be the most difficult," said Mark Riccobono of the National Federation of the Blind, adding that the car must be near-perfected before his charity can push the car to law-makers and the general public. He said this effort will take millions of dollars in development.